Play Food is a fairly small establishment, seating about 40 or so. It features a minimalist style of décor, with an eclectic collection of wall art, but, while it is sparsely furnished, it manages to avoid being austere. Being quite long and narrow, it would not be an easy space to work with but I found that the floor plan was not well used. The tables are very tiny (always a pet-peeve with me) and, given that there is so much wasted floor space, I think they could easily increase the table size without making the place cramped. I arrived in the early afternoon and the place was about half-filled. I was seated and attended to promptly and, throughout my stay, the service was very friendly. My waiter helpfully explained the menu and was always on hand without being overly intrusive. 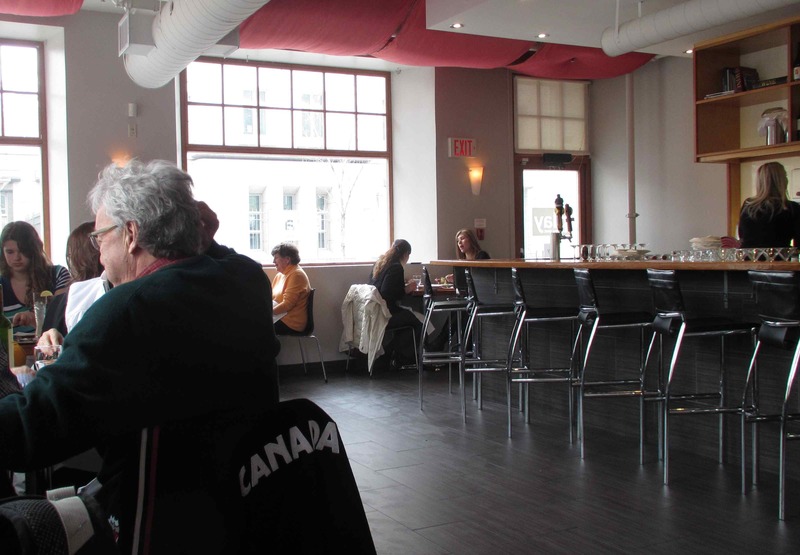 This restaurant is primarily a Wine bar with a small but interesting selection of ‘small plate’ savory dishes, some sweets, and customizable cheese and charcuterie plates. The wine selection is fairly extensive (there are also some nice beers to choose from) and each dish on the menu has a suggested wine pairing. My waiter explained to me that the savory dishes are listed in order of ascending ‘heaviness’. 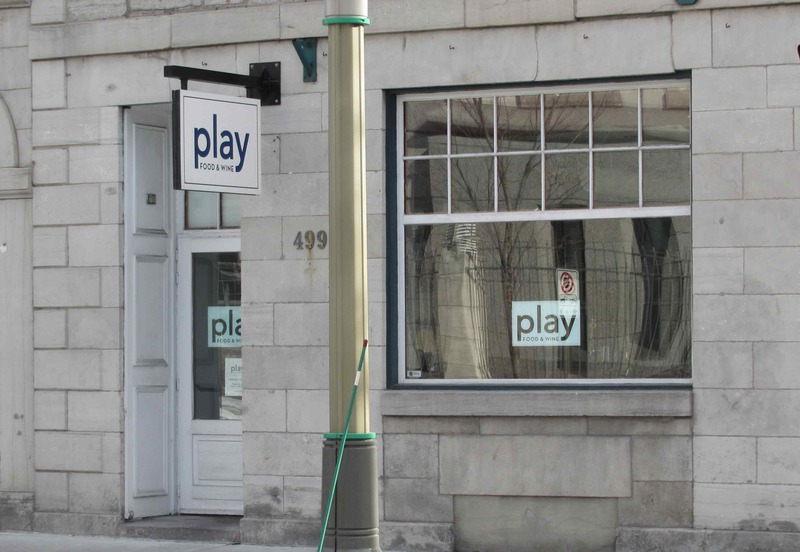 Play Food and Wine is a sister restaurant to Beckta and Gezellig. (neither of which I have visited as yet). One of these (I forget which) makes the bread for all three establishments and the complimentary slices I was served were excellent. The crumb was very dense and moist and had a lovely malty richness to it. It might be less popular with those who prefer a lighter, fluffier crumb but I really enjoyed it and the main challenge was not eating too much. 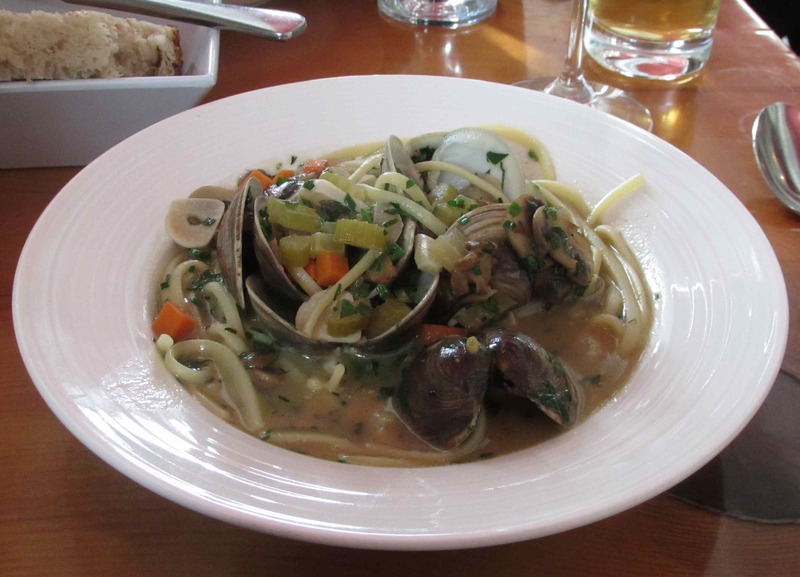 Little Neck Clams with Linguine, Mushrooms, Miso, Garlic and Soffrito – This was a lovely dish. The soffrito was a bit misnamed, being quite large chunks of carrot and celery (rather than a sautéed fine ‘battuto’), but the lovely wine based buttery broth with the large slices of mild garlic was a real treat. My only criticism was that linguine was probably not the best choice here as it really needed a thicker ‘clingier’ sauce and something a little better suited to ‘mopping’ up the juices (polenta perhaps) would be an improvement. 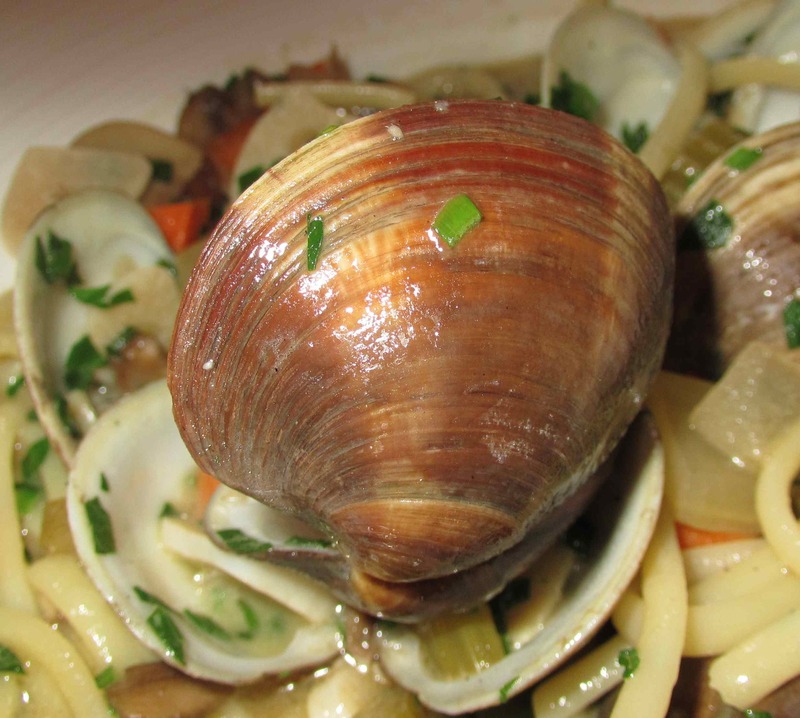 The clams used in this were a variety I have not come across before and were deliciously sweet and tender. They may actually have been a bit too delicate for this treatment (even though the sauce was very subtle), but I still enjoyed them very much. The wine suggestion was a Casale Marchese Frascati and it was indeed a good pairing being sharply crisp with nice fennel notes. I actually thought it one of the nicest white wines I have tasted. Despite any of my above noted criticisms, I felt the wine and the dish each rated a solid 5 out of 5. 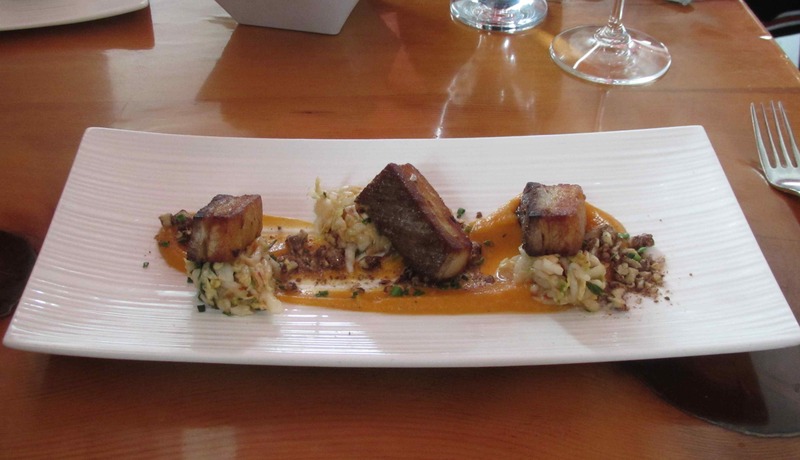 Pork Belly with Kimchi, Sweet Potato and Candied Pecan – I can’t say I enjoyed this dish as much as the previous one but it was still very interesting. The sweet potato was just a smear of puree as a base and was a bit bland. The Kimchi was, I believe, a ‘quick pickle’ variety and was quite nicely tart, while the candied pecan was a brief dusting as a garnish. The pork belly chunks were quite thickly cut and, by themselves, tasted no different than the rashers I typically serve with breakfast. Taken together, all the components worked quite nicely together but I really felt the pork belly should have been cut a little thinner and given a glaze or other flavor treatment independently of the other accompaniments. The dish was a novel conception and, even though I felt the execution needs tweaking, I still thought it deserved a rating of 4 out of 5. 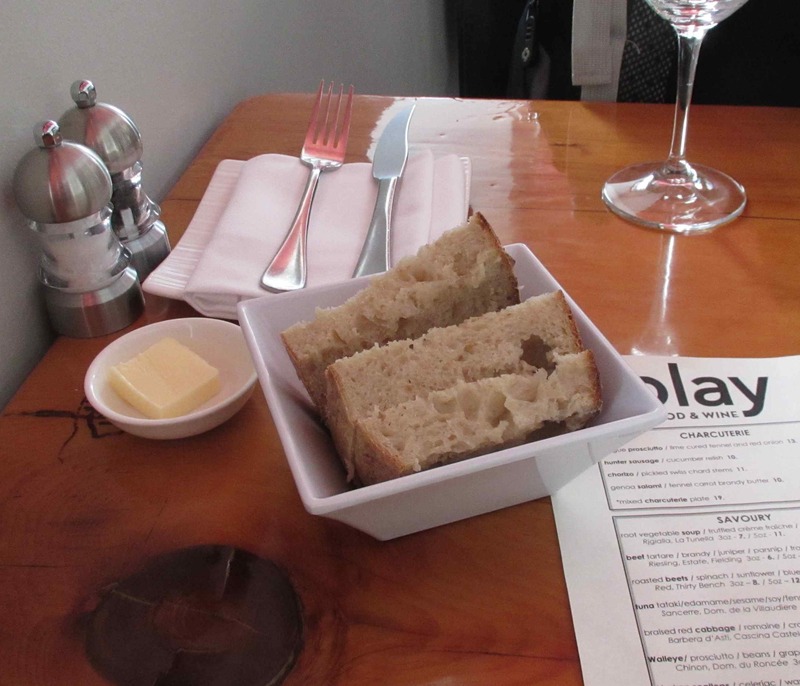 Play Food and Wine is a delightful little place and well worth a visit. The prices are very reasonable for the quality of the food and I would happily return. Taking into consideration the excellent service and ambience, I gave it a 5 out of 5. Great review, very detailed and nicely written. This looks like the kind of place I’d enjoy! Gezellig is a very Dutch word?! Didn’t you have wine with the pork as well? I did actually … just forgot to include it. The recommendation was a Mittnacht-Klack Gewürztraminer but the waiter said it was a bit sweet and I seemd to recall having it in the past and not being impressed. Instead, I went with a 2009 La Quercia Montepulciano D’Abruzzo, which was possibly not an ideal pairing but I rather liked it. As it turned out, when I went back and checked my wine tasting records, it was a Mittnacht-Klack Riesling I didn’t care for so the original recommendation may have been alright. Thank you. I am sure I will be back. I gather the menu changes quite regularly. Good review…the clams look like ones we get here in New England that are called mahogany clams. As a designer, the logo strikes me as very odd for an eating establishment. It must have taken the willpower of 100 saints not to design a playful logo. Small tables are a pet peeve of mine too. Especially when you’ve got wine glasses, other drinks, water and more than 1 tasting plate each. Interesting place! The outside does not look too attractive. Glad you found this enjoyable. Wine does matter! Actually, it is quite a handsome building. Just not a great picture. Looks nice! Pasta and clams are one of my favorites. We get little necks down here. They are yummy.